Katrina Adams, Chairman of the Board, CEO and President of the USTA is making the fast-growing Hispanic population in the United States a priority as she begins her two-year term. Part of that is bringing a Hispanic Outreach clinic, featuring 17-time Grand Slam champion and two-time Olympic gold medalist, Gigi Fernandez, to drill junior players at select Emirates Airline US Open Series events, like the BB&T Atlanta Open at Atlantic Station. Fernandez, peer of Adams when they were both playing professionally, couldn't be more excited to be a part of the Atlanta clinic, and a similar upcoming clinic in New Haven. 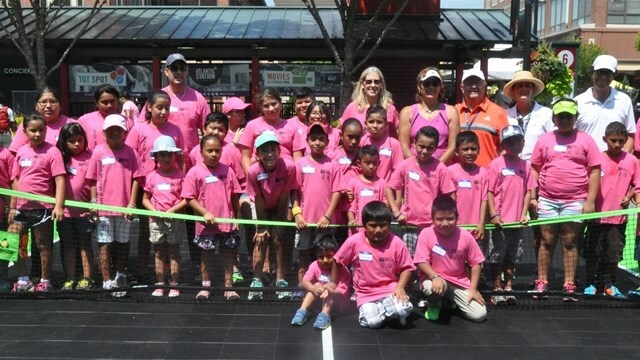 "I'm so honored that Katrina has chosen me to represent Hispanic tennis players here in the US," said Fernandez taking a break from teaching about three dozen youngsters the basics of tennis. "Both Katrina and I have also shot commercials encouraging Hispanics to play tennis." Fernandez was joined by ATP World Tour player, Fabrice Martin, a Spanish-speaking doubles specialist from France to speak and hit with the junior players on the short courts set up at Atlantic Station. The 6'6 Martin may have dwarfed the 8-10 year olds he was sharing the court with, but he made sure they received a good introductory lesson in forehand and backhand volleys before he left to warm up on the tournament's practice courts. Being a family sport and a sport one can play their entire life, Fernandez says there is no reason why the tennis playing Hispanic population cannot continue to grow. "We are offering these free clinics (this summer) and hope to get people to come out and play the sport of tennis." This all begs the question, is there a Hispanic-American tennis star on the horizon? "We have a lot of Spanish players, as Nadal is one of the greatest players of all-time, but it wouldn't hurt to have a US-born Spanish-American at the top of the sport." Fernandez says getting a racket in the hands of young Hispanics is what the initiative is all about. "It's a sport they can do for a lifetime and we are getting the message out in places like Atlanta and around the country."